Bibi Trabucchi lives and works in Rome. 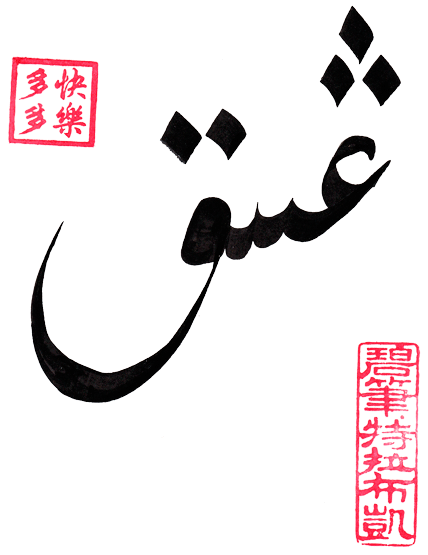 Here she founded “Alif”, a Cultural Association for the Study of Calligraphy. As a journalist she has contributed to the major Italian journals. 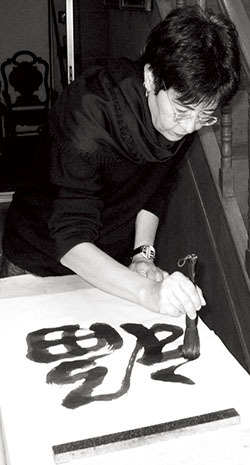 Since 1999 she has devoted herself mainly to her favorite art: calligraphy. She has been charmed by its artistic language and its development into abstract expressions of shapes drawn from ancient writings. Both Arab and Chinese calligraphy are her favorite subjects, she decomposes and recomposes them in a white space to recreate contrasts of shapes and colors. Her work is a homage to the “Sign Civilizations” - those cultures which give calligraphy, on an artistic scale, a place of honor. But her message goes far beyond. It is not important to understand what is written, but to communicate a feeling, to reach a universal language consisting in emotions, shapes and strong colors. Aesthetic values which stem from the abandon of rigid schemes imposed by every kind of calligraphy. Her awareness that dialogue between East and West can pass through a sign is testified by the discovery in her works of great calligraphic traditions, and the red seal of her monogram as the conclusion and testimony of the work itself. The knowledge of cultures and artistic expressions helps to understand and love distant worlds, and in our days this is most important in order to establish a dialogue of peace on the road to intellectual enrichment.